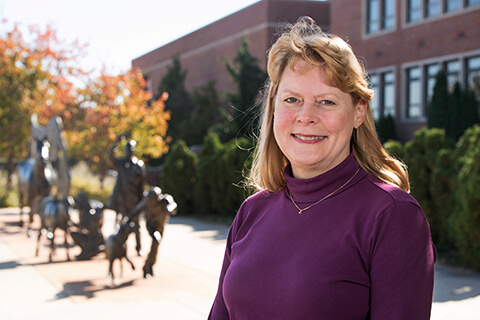 When Kathy Salisbury was first approached about taking on an associate dean position in Purdue’s College of Veterinary Medicine, she was hesitant. As a teacher and surgeon first and foremost who had taught at Purdue for 25 years prior, Salisbury would only consider a student-related position, and only if she could still teach. Now, as the associate dean for academic affairs since 2010, Salisbury helps students in the classroom, in the clinic, and as an administrator, and she has gained recognition along the way. What made you decide to become a board-certified specialist in small animal surgery, and what led you to Purdue? When I graduated from vet school, I had initially thought I wanted to become board-certified in internal medicine, because I liked problem-solving, interpreting tests and trying to solve puzzles. But when I got into private practice, I realized how much I enjoyed doing surgery, and I realized that if I became an internal medicine specialist, I wouldn’t be able to perform surgery on my patient -- I would have to refer them to another specialist. So, I changed my specialty goal and applied for a small animal surgery residency program. I ended up getting a residency at Purdue in 1981. I thought I would be here three years and move on to a teaching position at another university, but then I was fortunate to be offered a faculty position here. What changes have been made to the Doctor of Veterinary Medicine curriculum that you were involved in? The DVM curriculum used to be very lecture-based and there was just too much information in the curriculum. In 1996, we did a complete overhaul to pare down the content and focus more on major principles and concepts, and less on the details that are constantly changing. We incorporated problem-solving and communication skills by introducing problem-based learning courses. That was a big change for our faculty, and it took a lot of work and training, but we’ve been able to maintain the problem-based learning courses. Several other vet schools started problem-based learning, and most of them have stopped doing it now because it’s pretty labor-intensive for the faculty, but we have found it to be very beneficial for the students. More recently, a change in the veterinary technology program has allowed for vet tech students and DVM students to share a joint oath ceremony after graduation. We used to have a separate oath ceremony for each program, but this year for the first time, we were able to combine those ceremonies, and all the members of the veterinary team and their families celebrated together. It was very special, and something we plan to continue. What makes the curriculum at Purdue’s College of Veterinary Medicine unique? Most other vet schools don’t have courses like our problem-based learning courses, where students are actively involved in solving problems as a team. We provide more interaction with faculty here, because there is a faculty tutor for each of these small groups. And in our clinical techniques courses, our students are getting to handle dogs, cows, and horses, from the beginning of vet school. In some vet schools, that doesn’t happen for at least two years. You have won numerous teaching awards over the years. What would you say were the most important factors contributing to your success? I’ve had a lot of interaction with the students. Before I became an associate dean, I taught in the surgery labs, the problem-based learning courses, and the clinics. I think I showed that I cared and really took interest in helping students learn. So, I think caring, being enthusiastic, working alongside students and being a safety net -- those are some things that have helped me to connect with them. I still teach a lot, and that’s really important to me. Teaching is what I love. I want to stay connected with the teaching faculty and students so that I can help make the learning environment better. My favorite part is working with the students. I really love interacting with them and seeing the light bulb go off when they make a connection. I love watching them grow from first-year vet students -- enthusiastic, but inexperienced -- to ready to walk out the door, professional and confident. I feel that being in the position I’m in, that I can touch a lot of students. I can do that as a teacher, too, but it’s in a different way. I like being able to do both.